The story starts with George Beauchamp, a vaudville guitarist who wanted a louder instrument. There was considerable experimentation to make louder instruments in the days before electric guitars. George Beauchamp had some ideas and found John Dopyera was willing to experiment, even try some of his ideas. Geroge’s ideas did not prove themselves worthy but John pursued ideas of his own. Eventually he came up with the Tricone resonator guitar. John played violin and had also experimented making banjos. He was very particular in the qualities he was looking for in an instrument – a perfectionist. The Tricone fullfilled his requirements. It was louder yet had a balanced tone and dynamic range – a sweet sounding instrument. The guitar was an expensive instrument to build. The original instruments were always made from German Silver – a more expensive plating process than standard Nickel plating. Three six inch diameter spun aluminun cones amplified the sound of the strings – each was somewhat like a speaker for a music system. A T-bridge connected the strings to each of the three cones. The bridge is balanced on the tip of each cone and the cones are pointing into the guitar. The waffle weave sound holes in the metal guitar body gave the guitar an Art-deco look. The guitar was produced in both a square neck and a round neck model. Hawiian music was sweeping the nation and the square neck Style 1 resonator quickly became popular for that music. It was the style of guitar that George Beauchamp played. However, blues musicians also found the resonator guitar appealing. One of the most famous adapters of the Tricone was Tampa Red (AKA Hudson Whittaker). 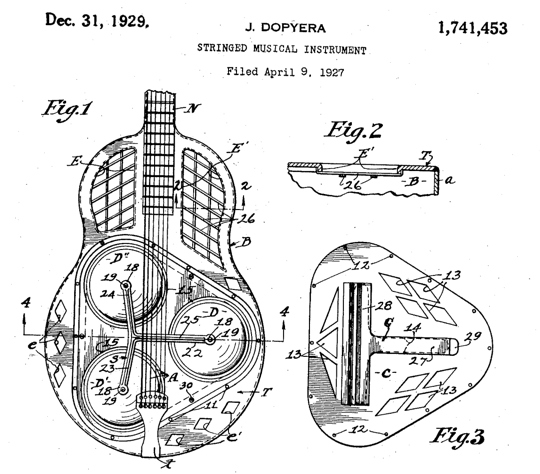 John Dopyera invented two more variations of the resonator guitar. George Beauchamp also figures prominently in the continuing story – as well as in several other notable guitar innovations. Adolph Rickenbacher also is part of the story. He supplied bodies for the National Guitar Company founded by John Dopyera and George Beauchamp. Later Adolph Rickenbacher and George Beauchamp founded the Rickenbacker guitar company. See coming artilces for the rest of the story. Next Post:What About Female Musicians?